A substantial three storey house of c.1840. The symmetrical five-bay front built in white brick has the central bay and pilaster strips at each end projecting forward; brackets under the eaves cornice are set against a white plaster frieze which is matched by a deep white band under the second-floor windows. The front door is protected by an open porch and the window above is emphasised by a bold plaster surround. The back is built in red brick and has a central projection which on the upper floors contains alcoves leading off the half-landings of the staircase and giving access to what were water closets. The plan, apart from the projections at the back, is square with the common arrangement of four rooms disposed two on each side of the central hall. This central hall has the entrance hall divided from the stair-hall by Corinthian pilasters carrying enriched entablature, the doorways to principal rooms have enriched architraves and overdoors and the alcove off the half-landing is reached between fluted columns with foliated capitals, but the detail of these decorative features is all coarsely designed. The property is a Grade II* listed building and is situated in a Conservation Area. It was the birthplace in 1907 of the poet, W. H. Auden. 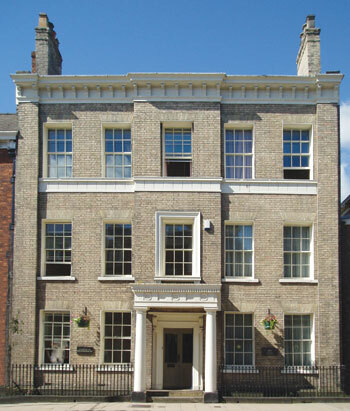 The building was once used as a dormitory by Bootham School, later to become the home of the Buddhists in York, and since its purchase in 1986 is now used as offices by a firm of chartered accountants, and is the registered office of this Trust.